Everyone is so busy dashing about at this time of year that it can be hard to organise a festive gathering of friends. When I was recently sent a rather snazzy coffee machine to put through its paces, my thoughts immediately turned to hosting a coffee morning. Afternoon tea is more my style and as my blog bears witness, I have often thrown an impromptu tea party. But a coffee morning when friends could drop by on their way into or out of town and grab a drink and piece of cake along with a quick chat seemed more appropriate this time. Pop-ups are all the rage, but I thought I’d stage my own pop-in. I’ve never had a coffee machine before, so I was rather intrigued to find out what this Bosch Tassimo Vivy T12 was going to be like. Bosch is a brand I respect and I’d heard a lot about Tassimo, so I was expecting something good. What first impressed me was how neat it was. I have a small kitchen and was worried about it taking up too much space, but I needn’t have done. It not only looked sleek and smart, but it was quite compact too. The instructions came in pictorial form, so it was easy to put together and prepare for first use. I did a trial run to be sure I knew what I was doing before my friends started to pop-in and I was quite impressed. As it turned out, my friends were too. Never had I served them with such artistic coffee – rustic is my normal style. The Tassimo capsules made for quick and easy preparation. I served Costa cappuccinos and Twinings Après-Midi d’Orient for the non coffee drinkers. The tea was black, scented with strawberries and contained rose petals. It was light and fruity with a hint of rose, which I really liked. It may have been better served for afternoon tea, but it was enjoyed nonetheless. The tea capsules came in a pack of sixteen and the cappuccino in a pack of eight espresso coffee capsules with corresponding milk capsules. Obviously I wasn’t going to serve only coffee and tea. I was taking part in Tassimo’s campaign to be the perfect host, after all. No, I made some hazelnut brownies adapted from John Torrode’s recipe for chocolate brownie cake with white chocolate chips. Who doesn’t enjoy tucking into a brownie? To find top tips on how to be the perfect host this party season from Millie Mackintosh and some more gorgious recipes from John Torrode, do visit Tassimo’s website. As it was a festive occasion, I decorated the serving table appropriately. Amazingly I had one last rose just coming out in my garden. This had to make an appearance. My top tip is for a scattering of chocolate coins over the Christmas table. It’s easy to do and doesn’t cost a fortune either. As well as looking festive and attractive, it has the added bonus of providing additional treats to tuck into. The brownies were sumptuous and like a famous brand of chocolate, there was a hazelnut in every bite. The roughly ground hazelnuts gave a lovely nutty crunchy texture which married well with their fudgy disposition and the white chocolate pieces and hint of whisky were an added surprise. In fact, I reckon these are up with the best brownies I’ve ever made. A good time was had by all and inspired by this success, I may do another pop-in dreckly, as we say down here in Cornwall. Karen has chosen glitter, sprinkles, candles and shiny stuff for this month’s Tea Time Treats over at Lavender and Lovage and The Hedge Combers. 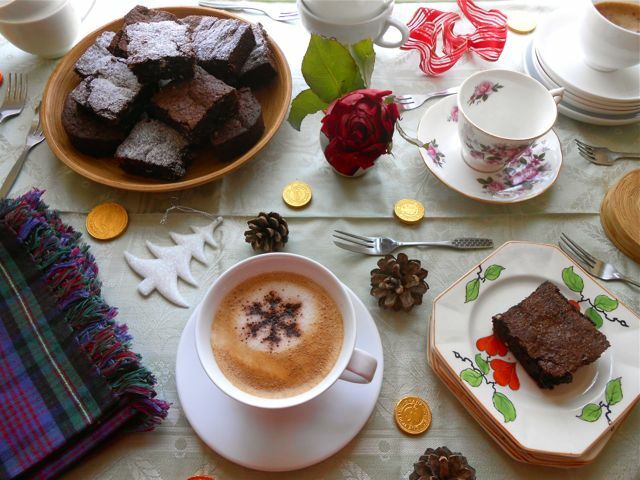 With the gold glitter on these brownies and the general festive table, I’ve decided to take part. This is a sponsored post, however all words, images and opinions are my own. A rich and decadent brownie with a deep hazelnut flavour which is probably more suited to adults than children. Melt the butter in a pan over gentle heat, then stir in cocoa powder and leave to cool a little. Roast hazelnuts in the oven at 180C for about ten minutes. Rub the skins off with a clean tea towel then blitz the nuts briefly in a coffee grinder or mini food processor so that some are finely ground and some ware still in large chunks. Beat eggs and sugar until the mixture is pale and thick. Fold the butter mixture in as gently as possible. Sift in flour then fold into batter along with the hazelnuts. Finally, stir in whisky and white chocolate chips, again keeping things as gentle as possible. Turn into a 9" square silicone mould and bake at 180C for 20 mins, when the top should be firm to the touch, but with a slight wobble to the mixture. Remove from the oven and leave to cool completely. Turn out of the mould and cut into sixteen squares. Dust half of the squares with icing sugar and the other half with a little gold glitter and arrange in a checkerboard pattern onto a suitable plate - I used a bamboo platter. We have a Tassimo machine, though we need the right cups for it, something we haven’t yet grasped and those brownies look amazing! Ah yes cups – though I didn’t find it a problem finding ones that fit. Good to hear you have one too Jen. The tea was really nice and the brownies over the top gorgeous. Well luckily, I had tea on offer for the non coffee drinkers and everyone loved the brownies. What a nice idea. Wish I could have dropped in on you for a coffee. I am also having serious plate envy for those deco plates, oh and the brownies look fab! Ah, thanks Janice. The sad thing is, I can’t remember where those plates came from now. Hazelnuts, chocolate and coffee are such a wonderful combination…. A tea-party of perfection! It is so busy right now, I am struggling to make ends meet! I could just do with an opportunity to sit down with a slice of this brownie and a cup of coffee!!!! Wish you’d been around to drop in for a quick breather Kate. It’s crazy busy now. To be honest I’ve hardly given Christmas a thought. Not even made a start on the cards yet – eek! I’m a big brownie fan. 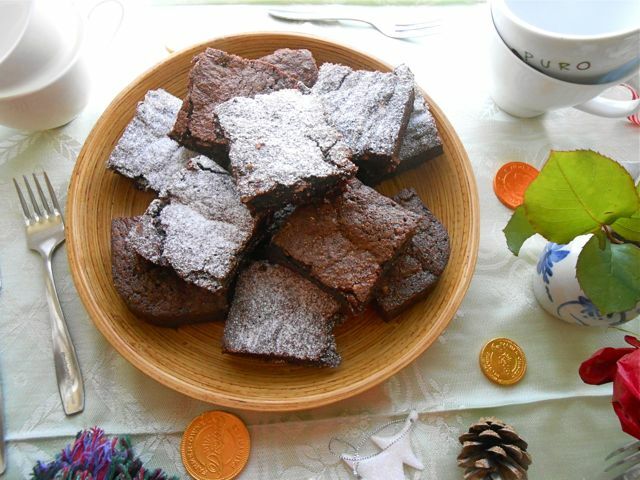 I think I might just try coffee chocolate brownies, they sound rather good! Coffee chocolate brownies are really good Fiona, but these hazelnut ones trump them – I think!!! What a nice idea. Love the snowflakes dusted on top of the coffee. The brownies sound delicious with the hazelnuts, 95g cocoa is a lot though! Thanks Katie. There was a lot of cocoa. There is no mistaking the chocolateness of these brownies. oh man!…roasted hazelnut brownies… simply heavenly… I adore the look of these and will add them to my must bake christmas list!… your photo’s are looking SO beautiful too with all the Christmas bits and bobs dotted around… such a pretty scene! Roasted hazelnut brownies and a cuppa sounds soooo good. I am currently enjoying my Tassimo too. Thanks Bintu. Looking forward to seeing how you’ve used yours. I would absolutely LOVE these brownies. ‘Saved’ recipe! Yum! Merry Christmas !!! Thanks Susan. Would love you to have been here to try one. A very Merry Christmas to you too. I am not a coffee drinker, but love to use it in the baking. These brownies sound very tasty! Haha, truth be told, I’m not much of a coffee drinker either Angie, but I’m with you on the baking.